Slice aubergines into 2.5cm (1-in) think rounds. Fry them in as little oil as possible using a non-stick pan. Cook aubergine rounds in batches for 3-4 minutes on each side. Set aside. Prepare filling. Place tomatoes in a bowl with basil and garlic. Add 1 tbsp olive oil, followed by salt and pepper to taste. Add feta cheese and mix well. Using a non-stick pan with no oil, toast pine nuts for 2-3 minutes, tossing continuously so they do not burn. Add to filling and stir to mix. Place 4 of the largest aubergine rounds slightly apart on a baking tray. Spoon some filling on top, then sandwich with the next largest aubergine rounds. Repeat to stake the aubergines and filling until the ingredients are used up. Meanwhile, prepare tomato sauce. Using a blender, process canned tomatoes and chilli until smooth. Season with salt and pepper to taste. Spoon tomato sauce onto 4 serving plates and spread it out evenly with the back of a spoon. 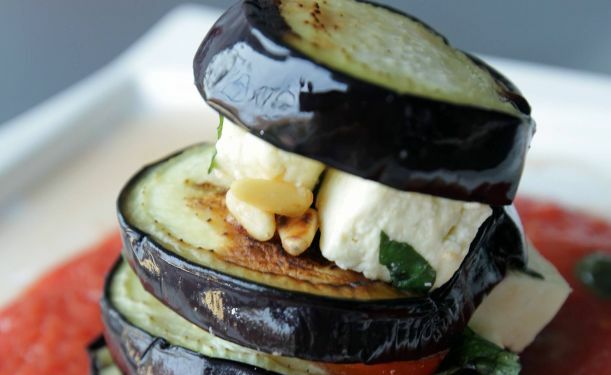 Arrange an aubergine stack on each plate and serve.